First half goals from Sone Aluko and Andy Little put Ally McCoist’s men in a commanding position and after Craig Beattie had missed a penalty in the second period it was Little who added icing to the cake with a third on 87 minutes. 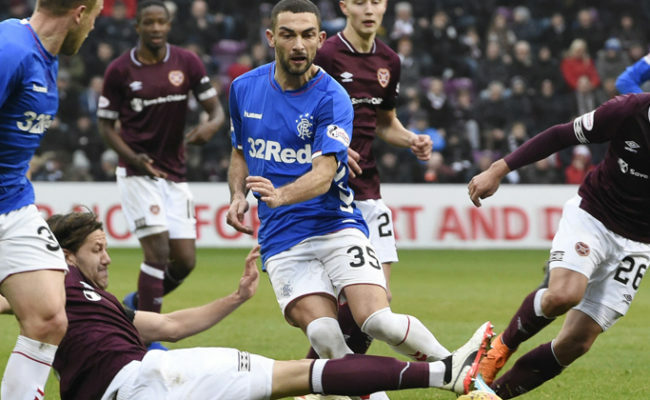 From referee Calum Murray’s first whistle the visitors looked hungry, throwing themselves into 50/50 challenges and not giving the Hearts players a second on the ball with Lee McCulloch leading by example. McCoist made three changes to his starting eleven for the trip to the capital with Rhys McCabe, Steven Whittaker and Lee Wallace replacing Sasa Papac, Steven Davis and Salim Kerkar. And the atmosphere within the stadium was electric at kick off with the visiting Bears once again getting behind their side brilliantly and the players responding in style. Hearts had the first real attempt on goal, if you can call it that, when Rudi Skacel’s ambitious 30 yard drive flew high and wide of Allan McGregor’s goal but from their the first-half was a one-sided contest with Rangers dominant. Just two minutes later Whittaker found Little on the right flank and his cross was met by McCulloch but he couldn’t get the power or accuracy to beat Jamie MacDonald. Kyle Bartley then had a shot blocked from a deep McCabe free-kick as the Light Blues tried desperately to make their early pressure count. Before the half hour mark they did just that and it was a fantastic strike that broke the deadlock. 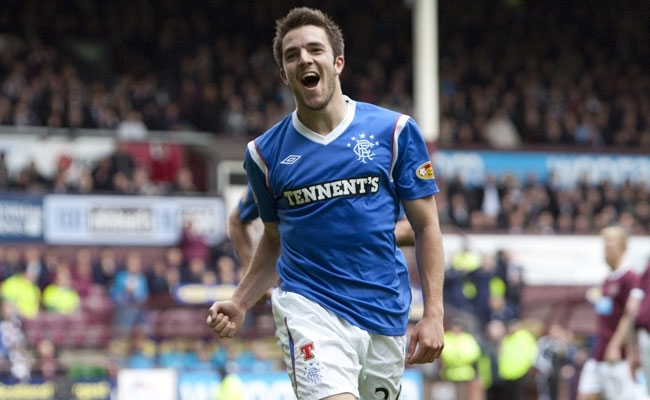 Former Ibrox stopper Andy Webster was fuming when a free kick was awarded for a foul on Edu 25 yards from goal. 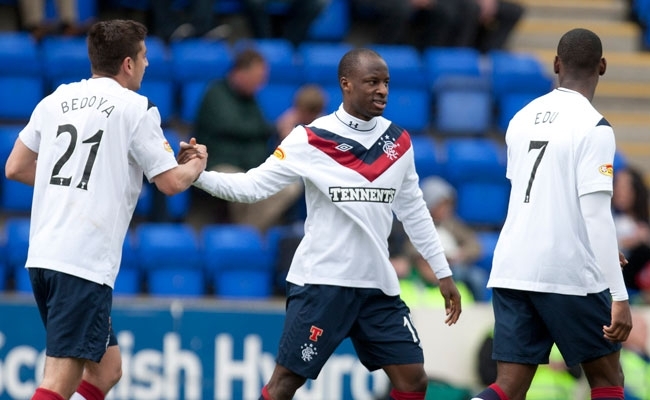 Aluko stepped up and his superbly executed left-foot shot dipped over the wall before nestling in the corner of the net with MacDonald diving helpless to his left. It was a moment of magic from the Nigerian and on 33 minutes the Hearts keeper had to pull off a wonder save to deny McCulloch from eight yards after good wing play from Whittaker. 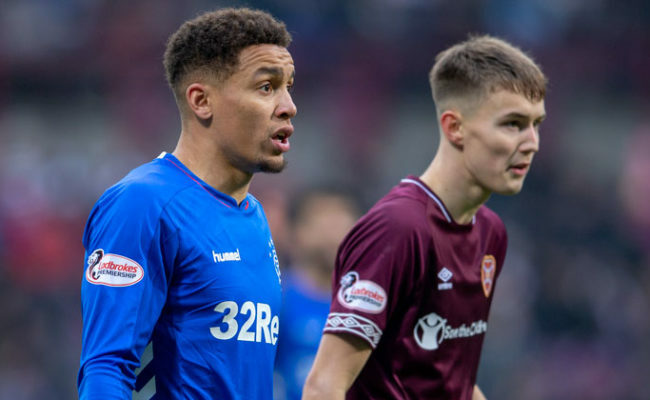 Hearts were struggling to cope with Rangers’ attacking play and on 33 minutes their hesitant defending was punished again when Little worked an opening in the box and his shot on the turn appeared to spin off Andy Webster and over MacDonald. It was a bizarre goal but it was no more than Little deserved after an impressive first half showing which highlighted his growing confidence. Into the second half and Hearts made one change with Suso Santana replacing the injured Stephen Elliott. And on 50 minutes a left foot drive from Hampden hero Craig Beattie was a yard wide of McGregor’s goal as the Jambos started to shift through the gears for the first time in the match. With Rangers pegged back before the hour mark Black also tried his luck from distance and McGregor had to be brave to dive at the feet of Skacel after the Czech had got in behind the Gers backline. With 23 minutes remaining Sergio threw on forwards Gary Glen and David Templeton and it was the latter who won a penalty for his side when he skipped past Aluko but was tripped on the edge of the box. Beattie placed the ball on the spot but unlike his penalty against Celtic at the national stadium he blasted it off the cross bar. If that had gone in it would have made it an interesting finale to this entertaining clash but in the end Rangers grafted until the final whistle and got their reward with a third goal on 87 minutes. Lee Wallace found space down the left and when he dinked the ball over MacDonald, who had sprinted off his line, Little had the simplest of tasks to roll the ball into the empty net. Man of the Match – Andy Little: Ulsterman put in an impressive shift and full deserved his brace on a great day for Rangers.